UDM Downloads > LastBit FireFox Password Recovery! 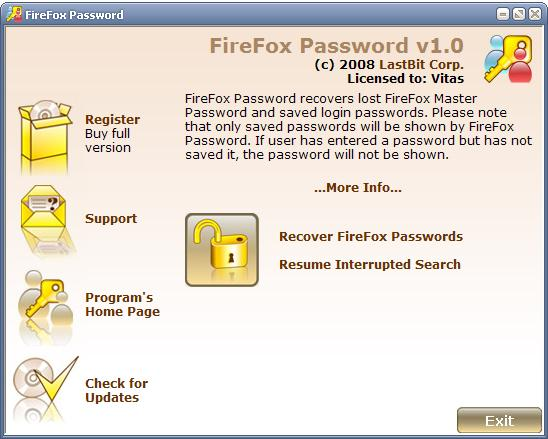 FireFox Password recovers lost FireFox Master Password and saved login passwords. If the Master Password is unknown, you have to recover it first. To recover the Master Password, you have to use the universal password recovery methods, such as Brute Force Attack and Dictionary Attack. FireFox Password is very fast, the search speed is about 1,500,000 password per second on a modern quad-core CPU, however if the password is very long and complex, it may take a lot of time to find the password. Use our Password Calculator to estimate the recovery time. Once the Master Password is known, FireFox Password displays all the login information stored by FireFox. There is no delay to decrypt and display the login information. For each item, the URL, login name and password data will be displayed. Please note that only saved passwords will be shown by FireFox Password. If user has entered a password but has not saved it, the password will not be shown.